Never Buy Expensive Septic Chlorine Tablets again! If you own an aerobic system that requires chlorine tablets you know how expensive and annoying that can be. Aerobic systems require a special type of chlorine tablets that are very expensive. You cannot use cheap "pool chlorine tablets" you must use "septic chlorine tablets". Many retail stores sell a 10 pound bucket of septic chlorine tablets for about $73. A homeowner must drop a new chlorine tablet in there septic system every 7-10 days. This means that a $73 bucket of chlorine would last about 3 months. This costs you about $300 a year. The Liquid Bleach Chlorinator Saves you money because it uses cheap household bleach. Stop Spending So Much Time Caring For Your Septic System! The Liquid Bleach Chlorinator holds about 2 gallons of bleach. This will last you about 2 months. With the Liquid Bleach Chlorinator you no longer have to replace tabblets every 10 days. You only have to pour in more bleach every 60 days. LBC Mfg. takes enormous pride in creating disinfection devices for wastewater management that every homeowner can trust and rely on. Whether it is an in-stock product or a custom made device, we want to give you a product that is worry free, cost efficient with less exposure to harmful chemicals as possible. LBC Manufacturing is proud to add the NSF approved Liquid Chlorinator to the market. The need for an alternate way of chlorination, that is certified to NSF/ANSI standard 46 by NSF INTERNATIONAL , is a necessary step to controlling the quality that all homeowners expect and deserve. LBC Manufacturing recommends installation by TCEQ licensed and trained installers! 2. Place the Liquid chlorinator housing on a level undisturbed base. This may be accommplished many ways, just ensure choice location does not allow the chlorinator base to move from its installed position. additionally, the housing lid must be above final installation grade. 4.Using PVC cleaner and glue, attach 20 feet of 4 inch pipe to the chlorinator housing. 6. Next, locate the poly vinyl tubing and route into the holding/pump tank ( The vinly tubing is flexable and subject to damage from sharp or heavy objects. 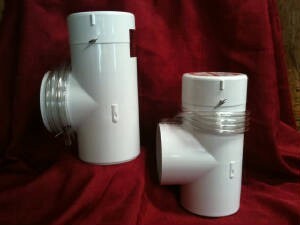 It is prefferred to install the tubing in a sleeve to help protect from damage. 8.Locate the poly vinyl tubing previously routed into holding/pump tank. Connect the end of the tubing to the venturi suction port. 10. Finally, Engage the sprinkler pump and ensure the Liquid Bleach Chlorinator is visibly moving bleach through the vinyl tubing. As described. Easy to install. Has not been installed yet. Did not come with instructions. Would have been nice to have instructions with product. It works, just overpriced!